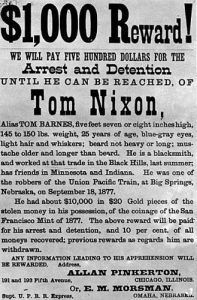 Tom Nixon, also known as Tom Barnes, was a member of the Black Hills Bandits, Nixon participated in the Big Springs train robbery in Nebraska and was never apprehended. 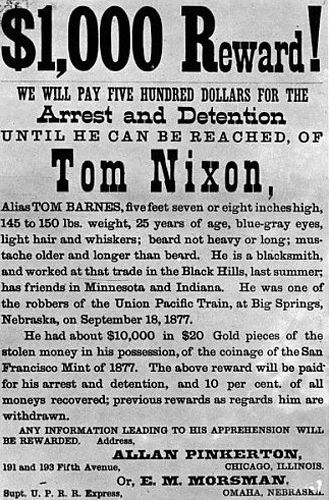 Nixon was thought to have hailed from Canada and was working as a blacksmith in Deadwood, South Dakota when outlaws, Sam Bass, Joel Collins, and Jack Davis came upon the scene. These three, who had recently driven a herd of cattle up from Texas to Nebraska, came to Deadwood to make their fortunes. However, they soon blew through the profits from the cattle sale and turned to robbing stages. Forming what became known as the Black Hills Bandits, Nixon, as well as two men by the names of Jim Berry and Bill Heffridge, the gang robbed seven stages within just a couple of months. Finding that stagecoach robberies were not profitable enough when split with six people, they soon decided to rob a train. On September 18, 1877, the gang robbed the Union Pacific Railroad at Big Springs, Nebraska, making off with more than $60,000. After dividing the money, the outlaws split up into pairs, each headed in a different direction. Nixon traveled with Jim Berry to Missouri, where Berry made the mistake of trading in his gold coins for currency. This tipped off the detectives and he was captured, wounded, and died a few days later. In the meantime, there was a reward out on Tom Nixon’s head for $1,000. He was described as being five feet seven or eight inches tall, about 150 pounds, 25 years old with blue-gray eyes, light hair, and whiskers. Before Berry died, he told authorities that Tom Nixon had taken off after arriving in Missouri, carrying $10,000. It has long been thought that he returned to his native Canada. By Kathy Weiser-Alexander, updated December 2018.